How Important is Google to Local Businesses? In the digital marketing world, we focus a good portion of our efforts on getting found or showing up in Google and Google-owned networks for a good reason. In case you haven’t noticed, Google pretty much owns everything related to the internet. 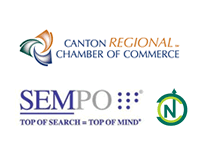 Of course, this is an overstatement, but their products and related advertising tools have extensive reach and can be extremely valuable to businesses owners, particularly those in our North Canton community. Did you know that Google processes over 40,000 search queries every second? That works out to over 3.5 billion searches per day! You can’t afford to ignore how your business appears when people search for it – or what people are saying about you online. 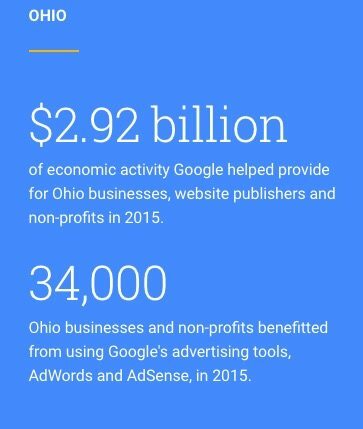 In the state of Ohio in 2015, over 34,000 businesses and non-profits benefited from using Google and it’s various advertising tools such as Adwords and Adsense. Google estimates it helped generate $2.92 billion in economic activity for Ohio alone (nationally over $165 billion). The potential economic impact is another reason why every small business should have a plan for utilizing Google. There is not much you can do about the distance factor in this equation. However, the Relevance and Prominence portions are areas you can influence. Every local business needs a local presence on Google, which requires a plan for providing relevant information to the search engines and for building prominence within the online community. For many businesses, the local population, will be the most significant customer base. And even if your business reaches national or global markets, how you appear locally in Google can be an indication of your domestic or global presence. When time, effort and budget are directed towards a businesses local search presence the results can be amazing. Consider this example of a client wh o shifted their focus to providing Relevance and showing Prominence in their local search area. 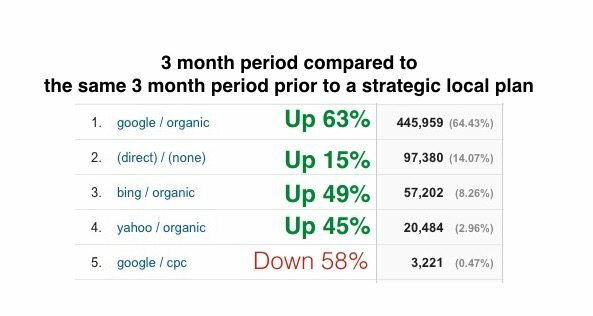 After implementing a strategic optimization plan over a three-month span, their result was a 63% increase in organic traffic from Google! This increase in organic traffic allowed them to cut their PPC budget by more than $6,000 a month while maintaining continual growth in web traffic. An additional benefit often seen is an impact on Bing and Yahoo traffic. While the user groups on these search engines are much smaller, they work in nearly the same way as Google does so your optimization efforts will carry over exposing your business to even more users. Larry Page and Serge Brin, Google’s founders, once wrote: “Our goal is to deliver services that significantly improve the lives of as many people as possible.” Even though Google has become the giant monster that it is, their philosophy still holds true today. Capitalizing on Google’s dominance in the digital world and focusing on your local rankings can allow your business to thrive in the digital world and significantly improve your life. If you are not sure where to start when it comes to Google or how your business appears in Google locally give us a call, leave a comment or fill out our contact form. Together we can build a strategic optimization plan and get your business showing up where it counts!